Tea Happiness- A blog on tea drinking, tea history, tea industry interviews, NYC tea experiences! 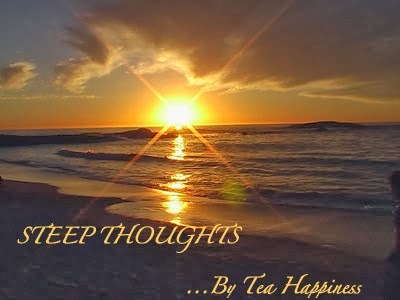 : Steep Thoughts- Do You Enjoy Coffee? Steep Thoughts- Do You Enjoy Coffee? This morning a coworker made too much coffee and offered me a cup. I don't normally drink the gasoline that comes out of the office drip pot, but this person grinds his own beans, uses an electric kettle, and brews in a Chemex pot. My mug was empty so I figured I'd give it a try. I usually add milk to my coffee and I have to admit this cup was super smooth and flavorful without a drop of anything extra. I started to happily sip the coffee, enjoying the flavor and even thought to myself 'gee, maybe I should drink coffee more often' when I was reminded why I stopped in the first place. After a few minutes I started to feel nervous. I felt an unpleasant quivery feeling in my core. This is not the same quiver I get when I hug my children or look into my husband's smiling eyes. It is more of an 'um, my body is telling me this is not good' sort of feeling. Even though I drink endless cups of tea during the day, a large cup of coffee still gives me the jitters. So as much as I love the idea of preparing coffee and enjoying the diversity of flavors, it's just not for me. But I can absolutely understand why you'd want to drink both. I also admit I've been seen drinking coffee on an occasional weekend morning in a small restaurant cup. I do much better with a small serving and not the mammoth 'small' size most cafes use for to-go cups. Sometimes the smell is just too tempting to resist. I found it interesting that my co-worker's brewing process reminds me a bit of my own tea ritual. The joyful attention to detail is an important part of the process. Hand grinding beans and watching the water brew through the glass pot can be a meditative experience. Chemex pots are gorgeous enough to tempt me to brew coffee, but I have to remember the after effects. Has anyone tried to brew tea in a small Chemex? I'd love to know the results. Do you drink coffee? Does it make you feel any differently than tea? I don't drink coffee regularly. I find that the amount of caffeine in most coffee is too much for me. Any more than one moderate-strength cup is sure to make me jittery, and sometimes even one cup is too much. I also find coffee is rough on my stomach. That said, I love the flavor and aroma of coffee, and it has a heartiness that surpasses even the most full-bodied of teas. Recently I discovered Teeccino, which is an herbal coffee substitute, and I've found that it gives me all of the things that I like about coffee (and in my opinion, tastes better than some cheap coffees) but while being caffeine-free and a lot easier on the stomach. I haven't ever tried a Chemex. I will say, the name seems unappealing to me. When I think "Chem" I think of synthetic chemicals and that just doesn't seem like the sort of thing I'd want anywhere near my food or drink. So, perhaps I could get past this and appreciate it as a good coffee brewer, but on some level I'm sitting here scratching my head being like: "They named it THAT? What a terrible marketing idea." Then again, if you're marketing to chemists or people who have positive connotations with the term "chem", it might be a good decision. I've tried Teeccino before, it is definitely an interesting alternative to coffee. I think it's a passable coffee substitute.